This is my biggest and baddest bot. It stores a ton of energy and because of the high weapon mass and relatively low RPM it is able to transfer a lot of that energy into its opponents. 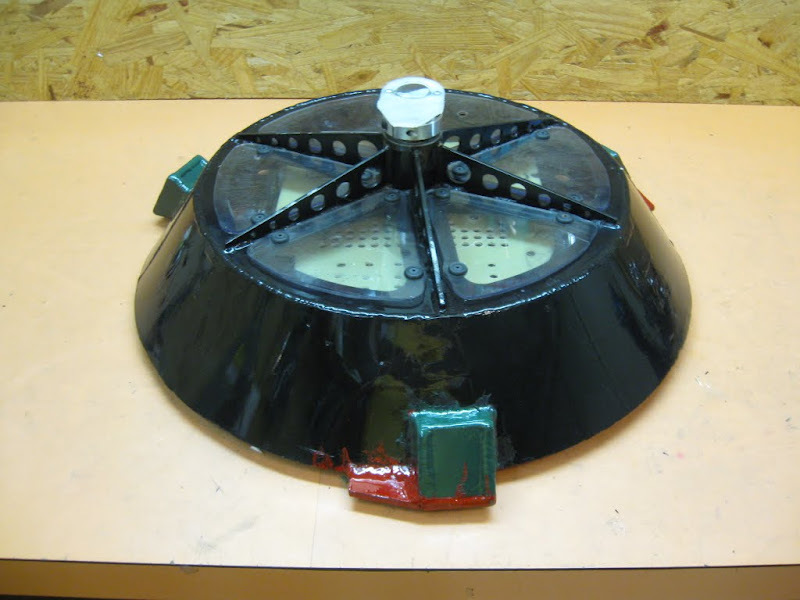 The most damage this bot has ever done was against Mangi at Motorama 2012 (linked above) where it split the frame and sprayed the electronics everywhere. This was especially gratifying because Mangi beat Tetanus twice at FI 2011 to take first place. Favorite Fight: No fights yet... Sorry! This is my newest "Try to do Something Ridiculous" bot. Check out this video on how it works. 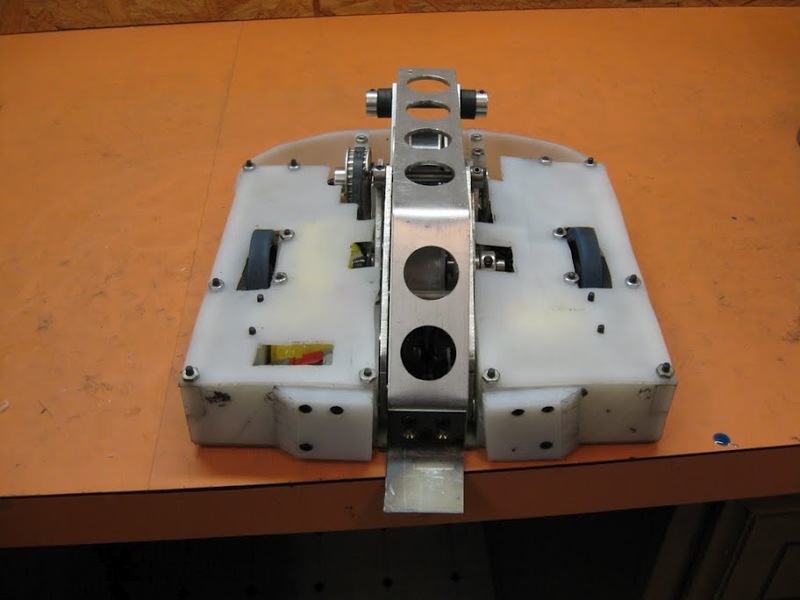 Note that the final version had to abandon the inverted clutch mechanism in favor of the original because the robot could not self-right when it was upside down with the inverted clutch version. The clutch and flipping mechanism work the same way in both versions - the only difference is the direction I spin the flywheel and whether I raise or lower the clutch wheels to engage it. The point was to build something that is clearly different from every other bot while stretching my design and manufacturing abilities. 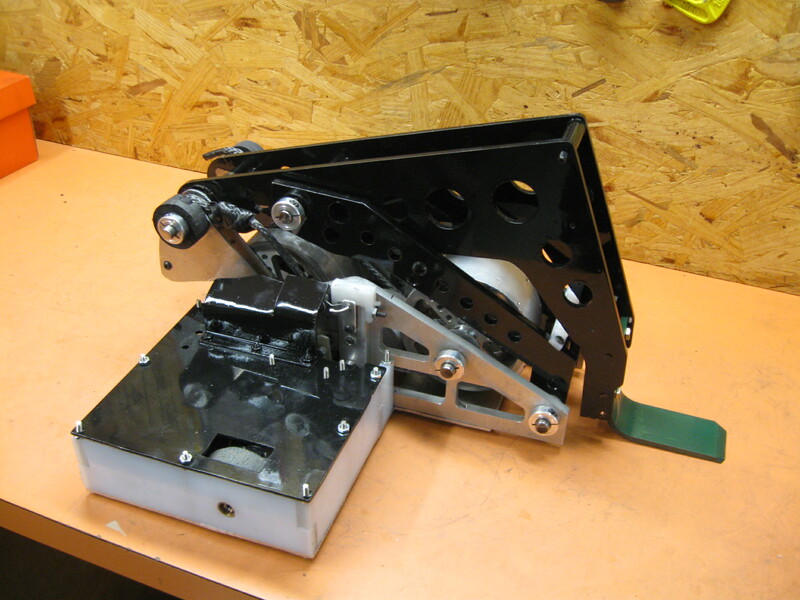 It is a scaled up version of Threecoil with a different flipper arm geometry and lots and lots more power. The tip speed on the flywheel is about 140 MPH and the bot does front flips when another bot is on the flipper arm. It uses a custom-built circuit board with an Arduino Nano installed in it to control engaging the weapon and turning off the throttle. This was my first foray into microcontroller programming and my first Sportsman class bot. The minimum measurement for success was to be able to flip three times without human intervention just like Threecoil. It can do that but if another bot is on the flipper it tends to do a lot of flying around. This was the fourth version of the weapon mechanism if you count the builds before Threecoil and the clutch part of the assembly seems to work pretty reliably. This is my previous "Try to do Something Ridiculous" bot. The point was to build something that is clearly different from every other bot while stretching my design and manufacturing abilities. The minimum measurement for success was to be able to flip three times without any human intervention. I was able to do this during testing but never in million years did I expect to win the competition. This was the third version of the weapon mechanism and the first time I had any success. I have been building combat bots since the Fall of 2003, but started working on designs and crazy ideas well before that. To see some of my retired projects over the years you can see the Legacy Bots page.